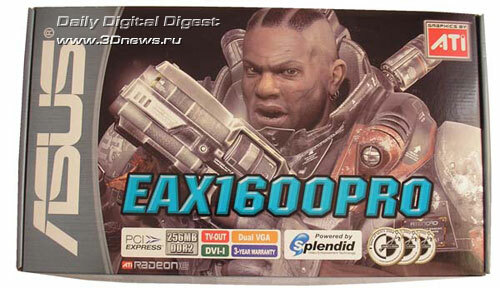 Emergence of video cards built on X1600PRO and X1600XT in the mid-end pricing range has somehow puzzled the buyers. On the one hand, prices for video cards based on GeForce 6600GT (a major competitor) have started going down, whereas 256 MB memory versions are increasingly filling the market. On the other hand, unsold X800 have been turned to X800GT/GTO/GTO2 after a series of tricks with the pipelines, so have become more affordable. Well, what to choose? We are going to help you answer this question. As a reference, i.e. a card which imparts sufficient performance limits, we chose ASUS EAX800XL. Since this card was once privileged to be at our test lab right after the announcement, let's briefly recall its major features to find out if something has been changed since then. 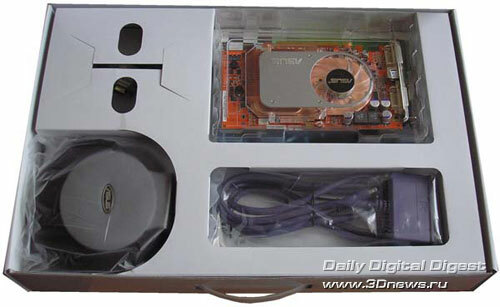 The video card is shipped in the same huge box with a handle to facilitate carrying the abundant package bundle around. 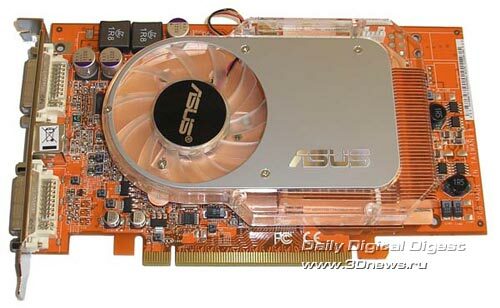 The video card is made on a red-orange board, traditional for ASUS cards built on ATI chips. 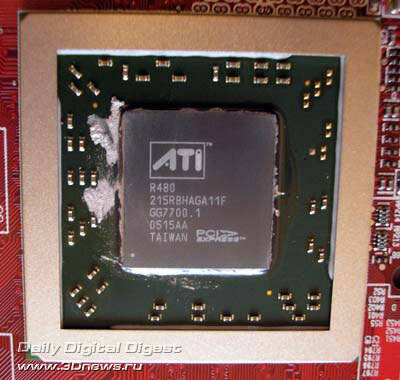 The front side containing the graphic chip and half the memory chips is fully covered by the cooling system, with no cooling components provided on the reverse side. The card does not require additional power supply, although there is a pad for its soldering. Monitors are plugged in via two DVI connectors (directly or via adapters), with a TV-out/video-in connector in between. The cooling system made up of a turbine with a heat-pipe copper radiator held by three screws and a bracket is easy to remove with a screwdriver. Its contact with the VPU is established with the "silver" layer as before. To spread heat, the memory chips on the front side are also equipped with a contact to the cooling system through heat-conductive washers. By the way, the cooling system runs quietly enough. 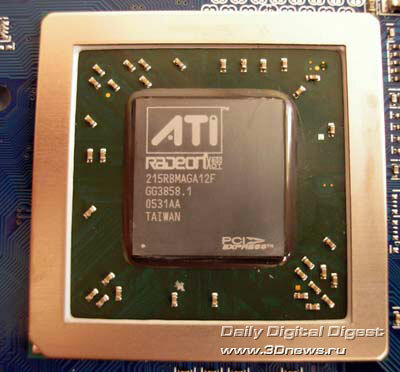 The R430 processor the video card is built on was manufactured quite long ago - on the 3rd week of year 2005. The chip comprises 16 pixel pipelines with a texture unit on each, as well as offers six vertex processors able executing version 2.0b pixel shaders. Therefore, it is compatible to merely DirectX 9.0b. The operating clock speed is 400 MHz. The operating clock speed is 400 MHz. The 256 MB video memory running at 980 MHz is linked to the GPU via a 256-bit bus. 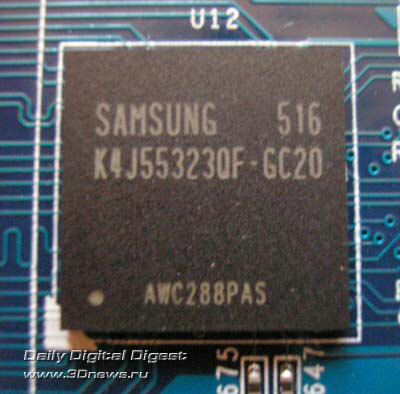 The card uses eight GDDR3 memory chips made in the BGA package by Samsung and offers 2 ns access time (which is equivalent to 1000 MHz). 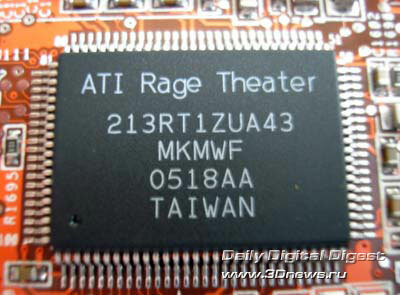 The VIVO features are implemented with a ATI Rage Theater chip. Despite the small size of the box, the bundle is very rich. 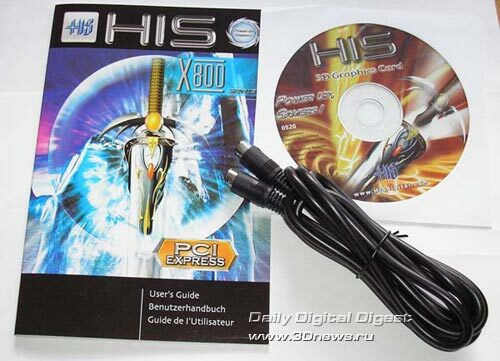 Besides the video card itself, the package bundle includes: two CDs with drivers and trial versions of games, a 15-pin D-Sub/DVI adapter, S-Video and Composite cables, S-Video/Composite and S-Video/HDTV adapters, an additional power adapter. 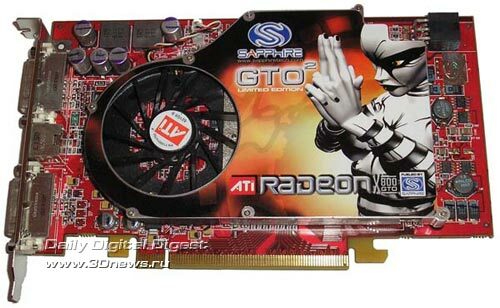 This video card is made on a red board and is almost covered with a one-tier cooling system, with the GPU and half the memory chips hidden beneath. In the upper right-hand corner, there is a connector for additional power supply. 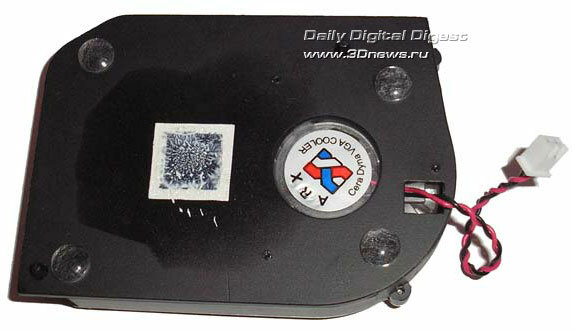 On the reverse side, there is the other half of video memory which is cooled by an aluminum plate. The VIVO chip is also here. The video card has two DVI-outputs and a combined TV-in/out connector. The cooling system made up of a fan and a composite radiator is fastened with five screws, two of which press the spring-loaded bracket. 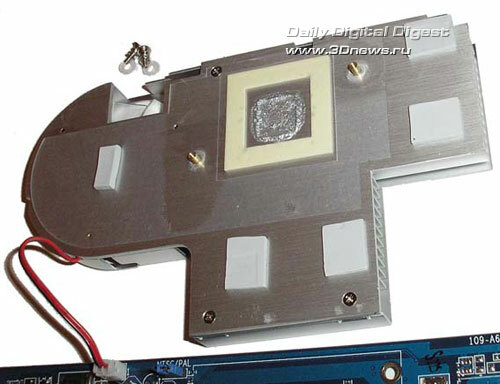 Heat is removed off the GPU with a copper plate, but the remaining part is cooled by an aluminum alloy plate. As the thermal interface, a "silver" paint is used for the GPU and white thermal paste - for memory chips. It is not quite clear why varied heat-conductive alloys are used for various components. As can be seen, the paste is not applied uniformly enough over the memory, whereas there is too much of it over the processor. The "silver" paint is always hard to rub, but sometimes it is nice to see something beneath. And here is the reward for struggle against the thermal paste. 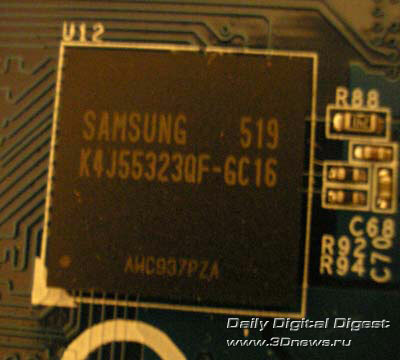 This board uses the R480 chip which was quite recently used to assemble the most powerful video cards. The major positive thing about R480 is the higher overclocking capability versus R430, which could have also been found over here. The GPU runs at 400 MHz. It proved quite difficult to get down to the marking either. The thing is that a small quantity of thermal paste applied is rubbed with the marking, too. 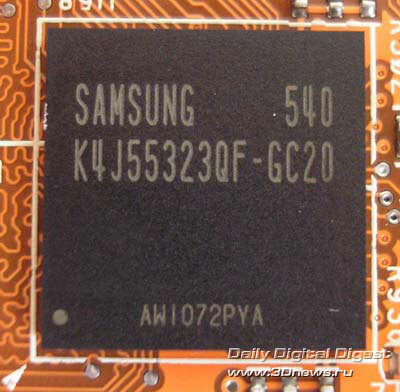 The video card is equipped with 256 MB of video memory as eight chips (four on the front side and four on the reverse side of the board) made in the BGA package by Samsung. The memory bus is 256-bit wide. 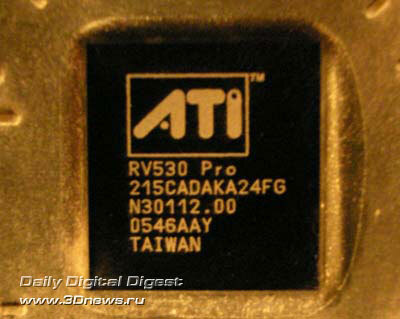 The access time is 1.6 ns, although the memory runs at merely 980 MHz. 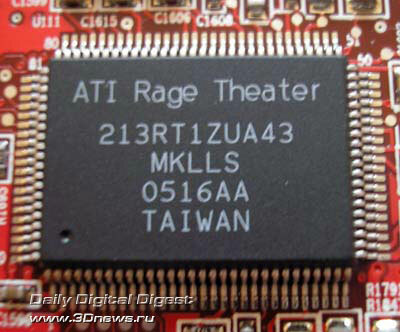 The ATI Rage Theater chip is in charge of video input/output features. The overclocking capability has proved rather high for the GPU, which was predictable - as many as 560 MHz, and unexpectedly low for the video memory - merely 1120 MHz, which is much less than the 1250 MHz which we hoped for (the memory frequency for the 1.6 ns access time). 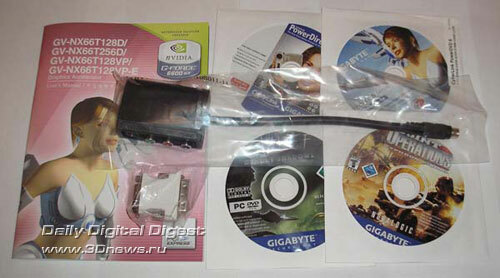 Traditionally for ASUS, the package is more than sufficient. Perhaps, a good thing is worth of a good attire. Only the tests will tell how good the video card is - but for now only the package bundle. 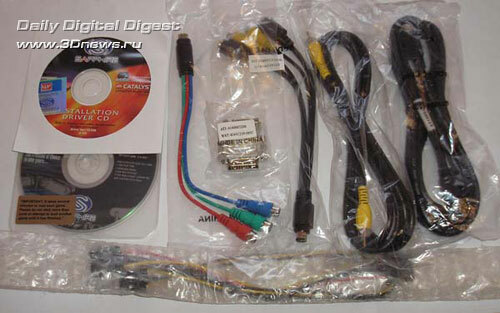 The package bundle has proved moderate enough even for such a big box: two CDs with drivers, software and user's manual; two 15-pin D-Sub/DVI adapters; a VIVO (9-pin S-Video/HDTV/Composite) cable; a brief setup guide. As is usual for ASUS, the board is made on a red-orange PCB. The front part of the card is covered by an impressive cooling system. 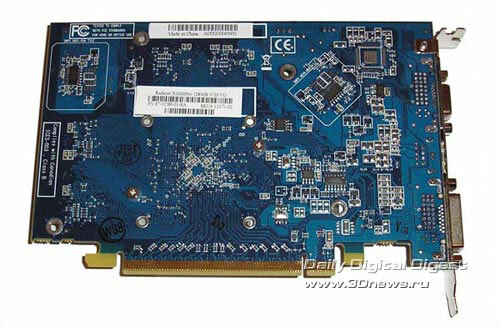 The video card operates without additional power supply, although the PCB has a pad for soldering it. There are two DVI and one VIVO connectors to plug in to the monitor and other devices. 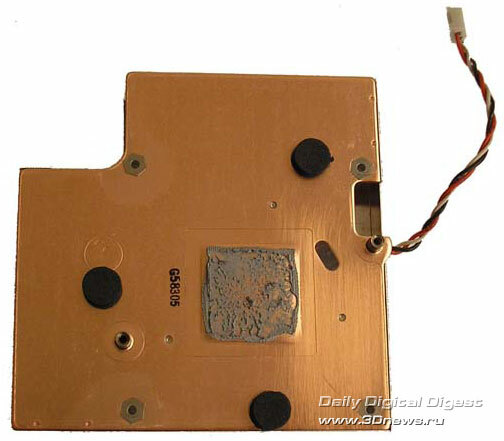 The cooling system like the PCB has been inherited from EAX800XL. The same blue LEDs snap on during operation and the same disputable issue of memory cooling only from one side of the card. 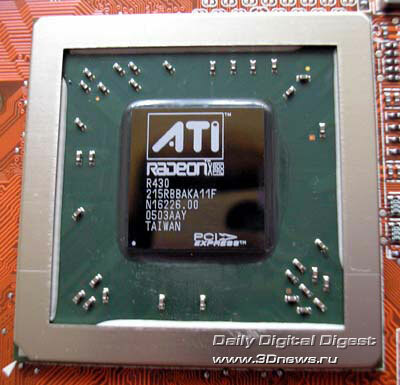 The video card uses the R430 chip manufactured on the 5th week of year 2005. To make the video card cost cheaper, the GPU has merely 12 pipelines of 16 available activated. The number of vertex processors has remained unchanged - 6. The memory bus is also the same 256-bit. X800GTO runs at 400 MHz. The card is equipped with 256 MB GDDR3 video memory in the form of eight chips in BGA packages, 4 on each side. It uses Samsung chips of 2 ns access time. 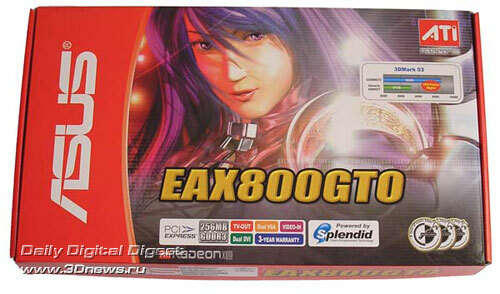 X800GTO runs at 980 MHz. Apart from image output to the TV, the video card also supports capture of video data sent from other sources (video camera, VCR, etc.) That is possible just due to the ATI Rage Theater chip. 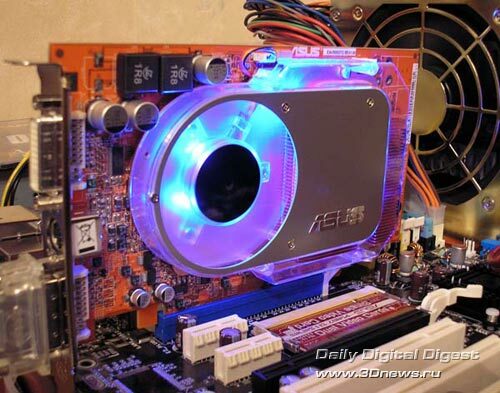 Once power is applied, the video card starts gleaming with blue lights. The overclocking can't be called successful. We were able to raise the clock speed by merely 15 MHz, and by 46 MHz for the video memory. That of course gave some minor performance boost which was almost negligible in some games. The box of the HIS video card is not that big but nice-looking. The size of the package is worth the contents. Why bigger? 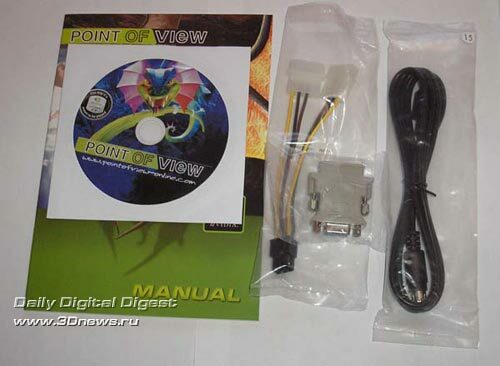 The package bundle does not contain anything extra: a user's manual, a CD with drivers, and a S-Video cable. The board is made on a red PCB. On the GPU, there is a single-tier cooling system that does not touch the memory chips, i.e. they are not cooled at all. No additional power is provided. The reverse side of the board is interesting for the aluminum radiators on the memory chips (they are fitted very tightly with glue). It turns out there is some misbalance in the cooling, therefore, to a high degree of probability these radiators are used for decorative purposes. 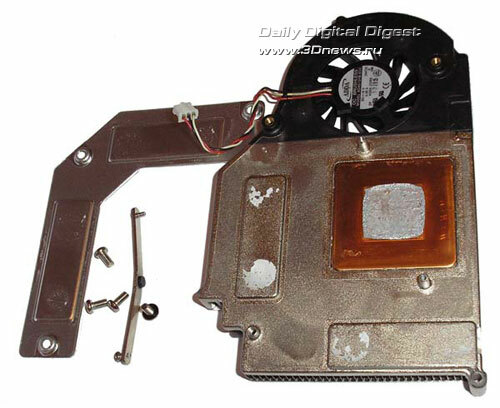 The cooling of the GPU is provided by a copper turbine with a quietly running fan, which is fastened to the board with three screws. The "silver" paint is used as the thermal interface. To plug in monitors, there is an analogous DVI and an analogous D-Sub outputs. There are also TV-out's. The video card has no input functionality. 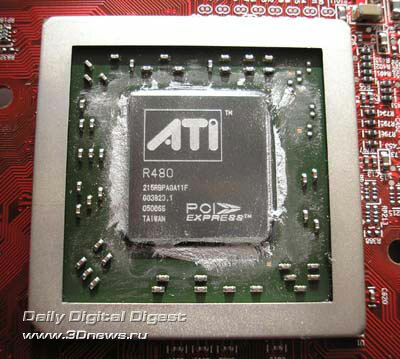 Once we rubbed the "silver" paint, we found the R480 chip which was made on the 8th week of year 2005. Use of this GPU should provide a very good overclocking result. Although merely 12 pipelines run in X800CTO, we can try making up for the missing 4 through raising the clock speed. By default, the GPU runs at 400 MHz. 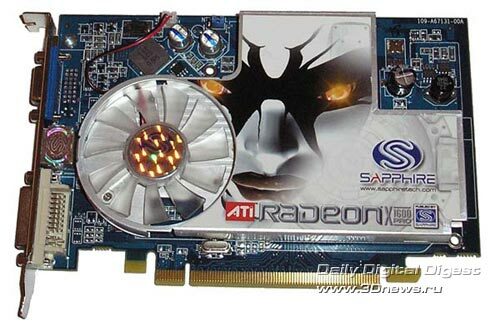 The video card uses 128 MB of GDDR memory assembled of eight chips, 4 on each side of the board. 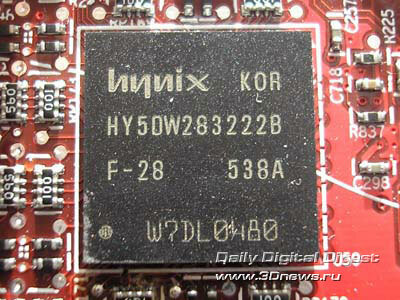 Used are Hynix chips of 2.8 ns access time, which should provide 700 MHz operating frequency. As we expected, it was possible to overclock the GPU by almost 50% up to 565 MHz, and at the same time we were able to start the chip at even higher frequencies although to the detriment of the image quality - artifacts came up. The memory overclocking proved more modest - 786 MHz, which is indeed not bad at all for the 2.8 ns memory. 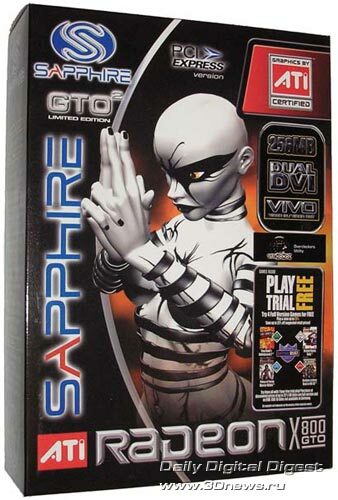 Sapphire X800GT arrived without package - simply in the OEM version. 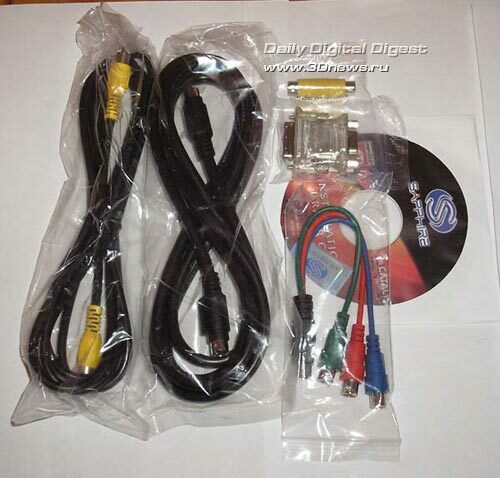 Besides the video card itself, we found the same bundle inside the package as that for the boxed version: a 15-pin D-Sub/DVI adapter, S-Video/Composite and S-Video/HDTV adapters, a S-Video cable, and a Composite cable. A drivers CD and a user's manual is missing. While the latter often goes to spoilage paper, the former would be really of great help. Despite frequent updates of the drivers and that in a couple of months such a CD is no longer urgent, not all users have fast access to Internet to download newer versions, and the most recent version is not always life-saving. But in most cases that is not an issue - the sales assistant will gladly present the buyer with an ordinary CD with the fresh driver recorded on, but anyway you'd better get ready that such is missing. These are shortcomings of the OEM package bundle. On the other hand, that is cheaper. The board is made of blue textolyte, is equipped with a small-size cooling system, although it is aimed at installing a more powerful turbine. The card does not require additional power supply. 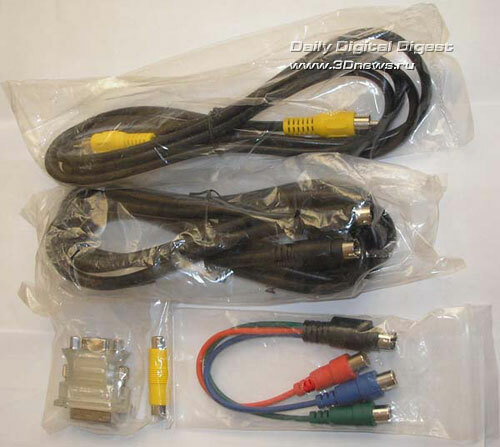 The card has all the necessary connectors to output image: DVI, D-Sub, and TV-out. 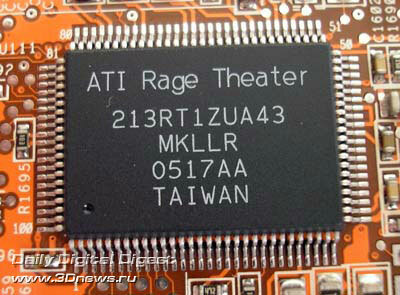 The card does not allow to input video with its functionality, since there is no soldered pad for a Rage Theater chip. 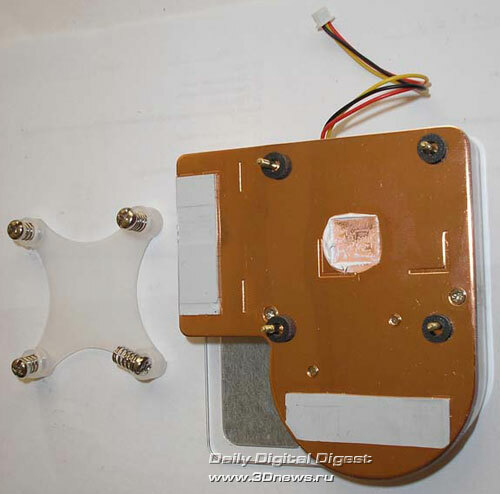 The small cooling system is fastened with merely two screws. It uses a copper radiator and, albeit small but a noisy fan. Although it allows adjusting the rotational speed, we were unable to get a quiet operation. It used the same thermal interface as that on BOX fans. 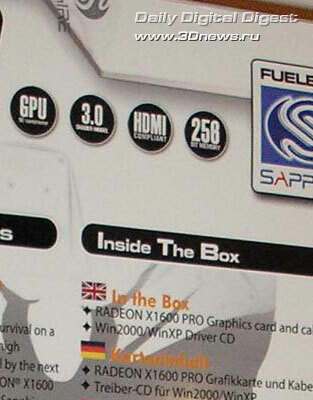 The card uses R423 GPU marked as X800GT, that is, merely 8 pixel pipelines with a texture unit on each are activated. The number of vertex processors has remained unchanged - 6. The operating clock speed is 475 MHz. The GPU was made on the 31st week of the last year. 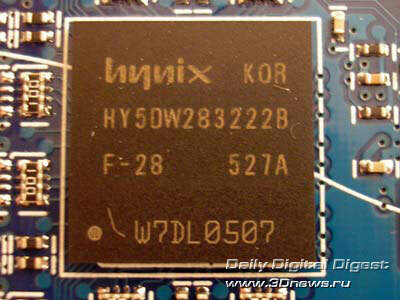 Some utilities (e.g., EVEREST 2.50) recognize the chip as X800SE. The memory bus is 256-bit as before. 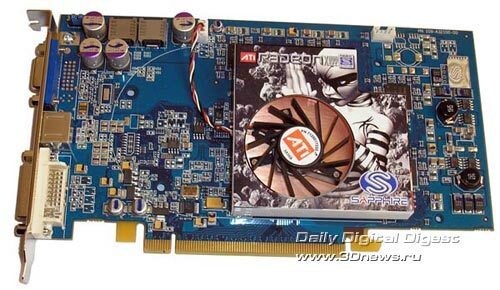 The card uses 128 MB of video memory, eight GDDR Hynix (2.8 ns) chips - four on each side, running at 700 MHz. There is no memory cooling on the card. Despite the no worst cooling, we were able to overclock the card to merely 581 MHz for the GPU and to 820 MHz for the memory, which gave a 17% performance boost. The video card is shipped in a box whose size is typical of a high-end product, and if there were bonus bundle items, then you won't do without a handle to carry it around. The bundled set inside the rich box is not that abundant: a user's manual; 4 CDs with games - Xpand Rally, Savage, BillyBlade, Mashed; 2 CDs with drivers, software and manuals; a 15-pin D-Sub/DVI adapter; a S-Video/Composite adapter. The board is made of red textolyte and is quite compact in size. The cooling system covers the GPU and memory chips on the front side. The card does not require additional power - there is even no pad for installing the respective connector. That means the power consumption of the card should be modest and fit within the maximum 75W provided by the PCI-Express 16x slot. To output image, there is a digital DVI and analogous D-Sub outputs, as well as a TV-out in the form of a S-Video connector. The cooling system is fastened with 4 spring-loaded screws. A quiet fan provides airing of the fully copper heat-pipe radiator. As the thermal interface, a thermal paste similar to KPT-8 (for the GPU) and heat-conductive spacers (for the memory) are used. Although cooling of the video memory on the front side has little practical sense, the memory chips on the reverse side of the board are not cooled. Under the cooling system, the RV 530 Pro manufactured on the 41st week of year 2005 is hidden. The GPU offers 12 pixel pipelines with 4 texture units and 5 vertex processors. The operating clock speed is 500 MHz. The memory data exchange bus is 128-bit wide. 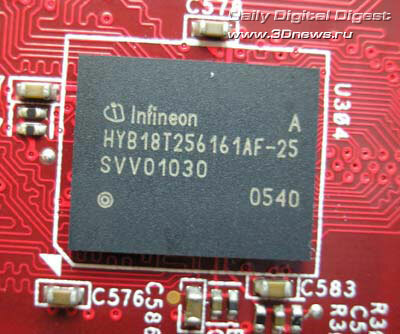 The video card is equipped with 256 MB of memory onboard made as eight DDR2 chips (4 on each side of the board) made by Infineon. The access time is 2.5 ns. The memory runs at 780 MHz, which is 20 MHz below the nominal value. The GPU manufactured following the 90-nm process technology with a good cooling system proved pretty pliant to overclocking. The video card was even able functioning at 650 MHz, but the image was abundant with artifacts. We were able to attain good-quality image through reducing the GPU clock speed to 610 MHz. 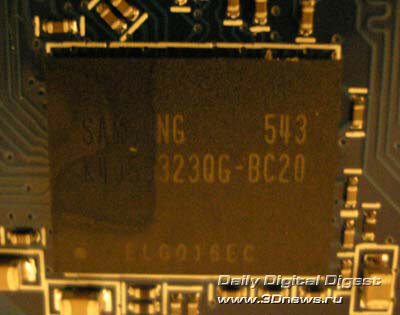 We failed to make the memory run at frequencies higher than 822 MHz, which is no wonder for 2.5 ns chips. For Sapphire, a box is not as important as what is inside. Although the package is of the proprietary design. you can't escape from humanoids bearing the CrossFire. On the bottom side, the box is not as cosmic but no less attractive. Let's not find fault with generality of the phrases, but you simply can't pass by the large inscription "256 bit memory". The inscription is not made in the eye-catching style, so we even didn't notice it at first. It's hard to say whether it was a blunder or a a marketing trick, or perhaps a search of hidden potentials. The official sources do not confirm availability of 256-bit memory bus in Radeon X1600PRO. 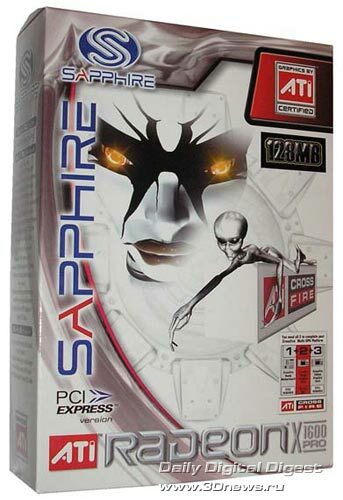 The specifications inform of a bi-directional 256-bit internal circular bus which is a feature of the X1000 architecture, but these are not the 256-bit to access the RAM of which the average buyer thinks on seeing familiar figures on the box. Therefore, marketing manipulates with facts to the maximum advantage. 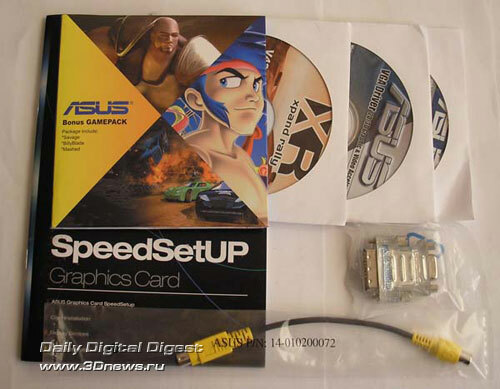 The video card comes bundled with the following items: a CD with drivers, a 15-pin D-Sub/DVI adapter, S-Video/Composite and S-Video/HDTV adapters, a S-Video cable, and a Composite cable. Almost all the front side of the board made of blue textolyte is hidden by a single-tier cooling system. Perhaps there were reasons why such a big radiator is used. 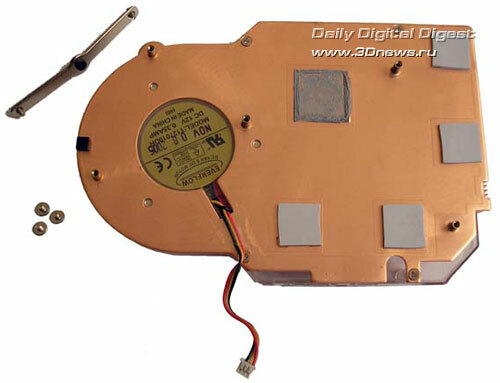 The reverse side of the board is free of important components. To plug in a monitor, there are DVI and D-Sub outputs. There is also the TV-out. Under the cooling system which is fastened with merely two screws, there is the GPU thickly stained with "silver" paint. The memory chips can also yield heat to the radiator through a pretty sticky thermal spacer. Unfortunately, it is not positioned precisely in all the places, so some of the chips almost have no contact with the radiator. The cooling system is made fully of aluminum. 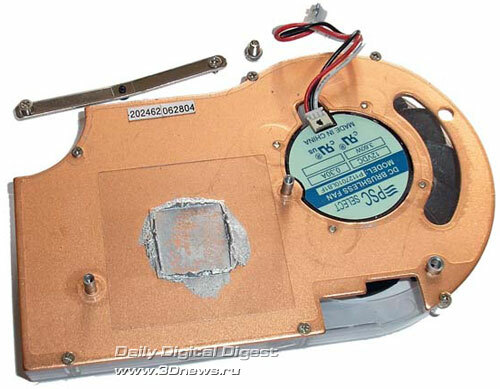 The fan of the video cards does not operate loudly, but nor is noiseless anyway. It is heard especially distinctly upon the system start. It took us quite a lot of effort to rub the "silver" paint off the GPU RV 540 Pro. The chip was made on the 46th week of the last year. The operating clock speed is 500 MHz. 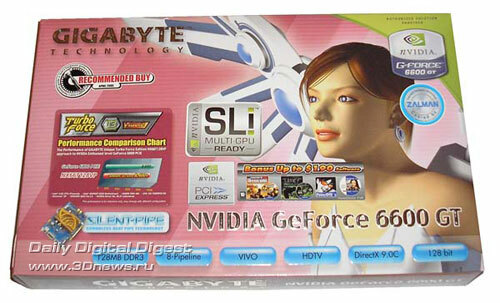 The video card features in the use of GDDR3 memory. 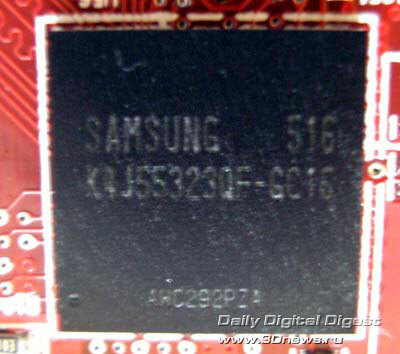 The 128 MB memory running at 1000 MHz is assembled of four Samsung 2.0 ns chips. On this photo, you can clearly see that the thermal spacer does not cover all the chip but only a corner - the same situation is with the remaining chips. Probably, the aluminum cooling system or unsuccessful choice of thermal paste or its excess, or partial lack of some memory chips prevented us from overclocking the video card successfully. 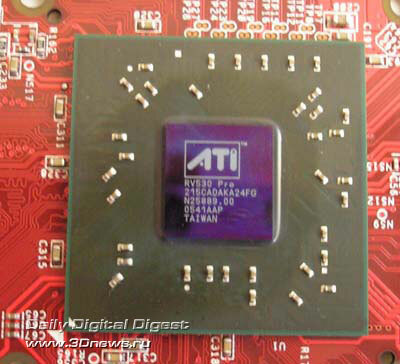 For the chip, the clock speed boost amounted to 60 MHz, i.e. 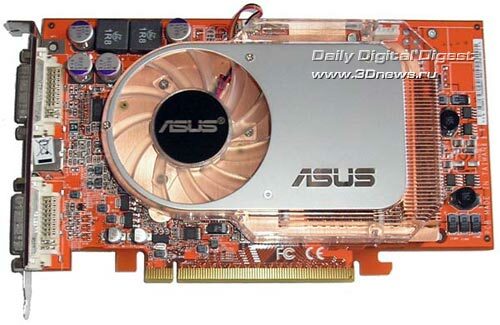 up to merely 560 MHz, which is much lower than 610 MHz in the ASUS video card. As to the memory - we failed to overclock it completely - even under a 2-3 MHz raise of the frequency, artifacts came up. 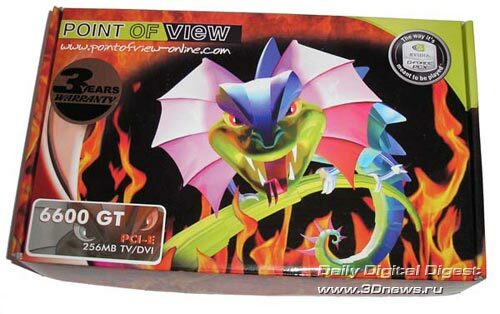 You can recognize the produce of Point of View from a distance due to its eye-catching package. Perhaps, it is one of the ways to attract the buyers' attention. 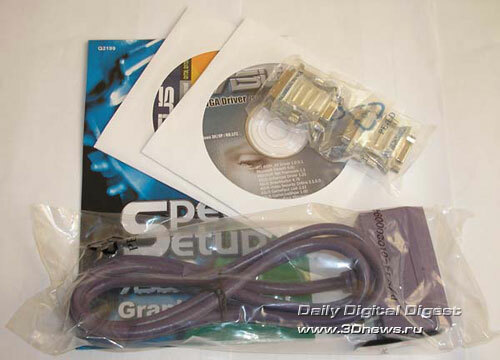 The video card is equipped with the following "gentleman's kit": a 15-pin D-Sub/DVI adapter, an adapter for additional power supply, an S-Video cable, a user's manual, and a drivers CD. The card is assembled on a blue textolyte board. On the front side, there is a GPU under the radiator and half the memory chips. The remaining memory chips are on the reverse side of the PCB. The card requires additional power supply, because the increased video memory capacity needs more power. To output image, DVI, D-Sub, and TV-out connectors are used. The card offers no functionality to input video because the required chip is missing, but there is a pad for its installation, i.e. you can come across versions with VIVO functionality. The cooling system of the video card is quite modest - a painted aluminum radiator (with white thermal paste) and a not very quiet fan. The memory chips offer no cooling at all. 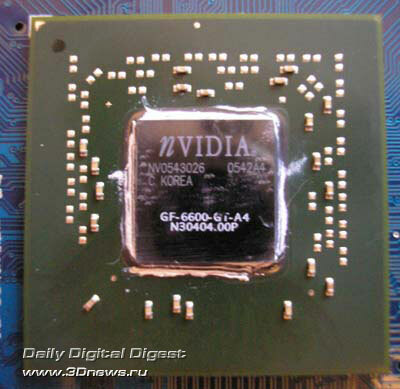 The NV43 (6600GT) GPU is of revision A4 and was manufactured on the 42nd week of year 2005. The chip runs at 500 MHz, offers 8 pixel pipelines, 3 vertex processors, and is fully compatible to DirectX 9.0c. 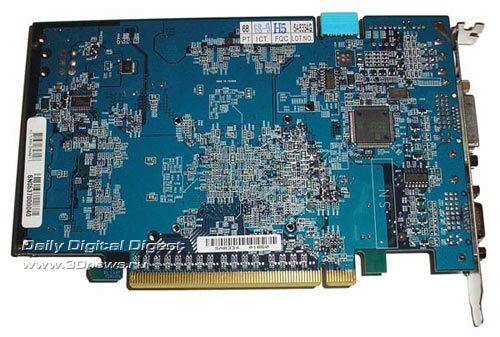 The card is equipped with 256 MB of GDDR3 video memory made in the BGA package, 4 chips on each side of the PCB. It uses Samsung chips of 2 ns access time. The nominal operating speed of the card is 1000 MHz. Despite the rather simple system for cooling and lack of such memory, we were able to raise the performance of the card through overclocking. The GPU was running stably at 560 MHz, and the memory - at 1120 MHz. That allowed to accelerate graphics processing by additional 10%. 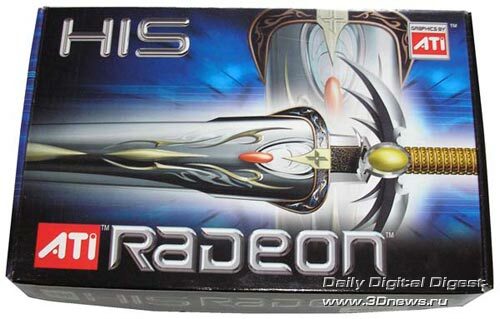 This video card is shipped in a nice-looking and relevantly colored box. 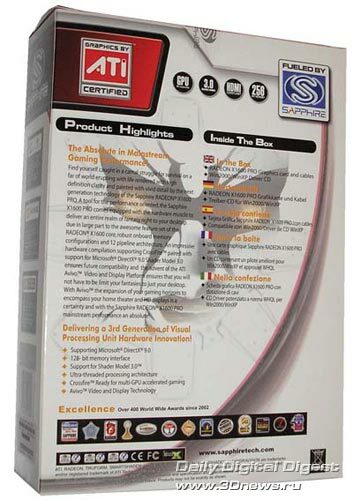 The package bundle includes: a 15-pin D-Sub/DVI adapter, a VIVO (9-pin S-Video/HDTV(color difference)/Composite) cable, a user's manual, 4 CDs with drivers, software and games. To improve operation of the SILENT-PIPE cooling system, the card is additionally equipped with an enforcement frame. The board is made of blue textolyte, but almost all the components are hidden under the passive cooling system. The SILENT-PIPE itself is made up of a heat pipe and three radiators, two of which are positioned on the reverse side of the board, closer to the GPU fan. The radiator on the from side of the board is to a more extent aimed at pressing the heat pipe to the GPU. This passive cooling system is fastened with merely two spring-loaded screws. Much has already been said about the efficiency of such cooling, but we should make some addition. The board passed all the tests without enabling the additional fan and even proved to get overclocked somehow. Already upon dismantling the test bench, we found some overheating of the card (we powered it off, but were unable to remove the card from the PCI-Express connector since it was too hot). So we had to make a check measurement of the temperature with ATITool. As you see, the temperature of the chip immediately got to 90°С, so we had to turn the PSU with the vent holes towards the video cards, which helped to reduce the temperature of the video card a bit. That's where we recalled the bundled fan.. The temperature dropped to acceptable 78°С, and the cooling system stopped being noiseless. But let's come back to the exterior of the card without the SILENT-PIPE. The memory chips are positioned over only one side of the PCB. The video card does not require additional power supply. To output image, DVI and D-Sub connectors are used. There is also a VIVO connector to input video and plug in the PC to a TV-set. The NV43 GPU is of revision A4 and was manufactured on the 17th week of the last year. The chip runs at 500 MHz. 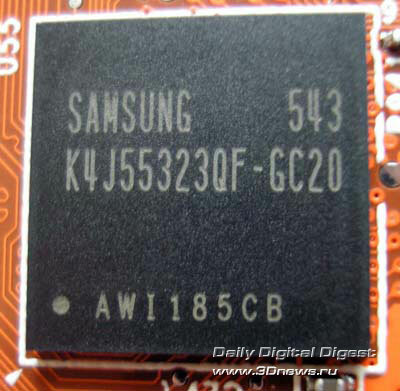 The video memory is assembled with four GDDR3 Samsung (1.6 ns) chips of total capacity 128 MB. The memory runs at 1120 MHz. 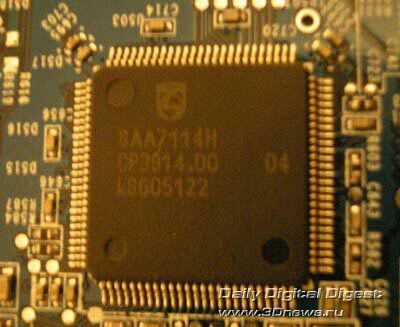 The Philips SAA7114H chip is in charge of VIVO functionality. 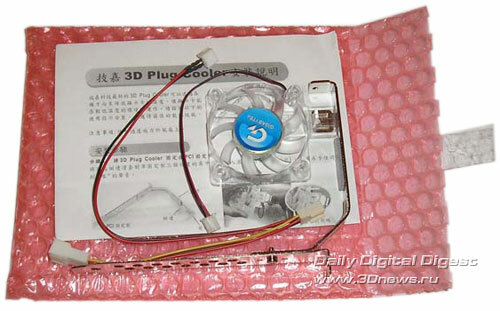 Despite the original extreme performance of the cooling system, we were not afraid of trying the card for overclocking. Considering all the circumstances, the experiment can be called successful. 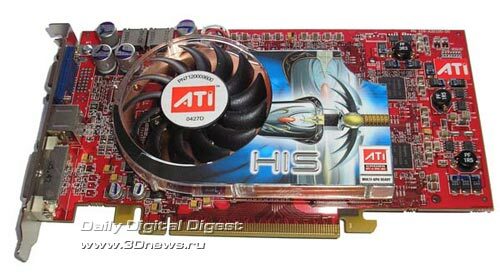 The card ran all the tests without failures and artifacts at GPU speed 565 MHz and the memory frequency 1140 MHz. As usual, let's start with the synthetics. The OpenGL benchmark Codecreatures Benchmark Pro keeps being rather a hard nut to crack for most mid-end video cards, although the set of tests is a bit outdated. This benchmark gives an easier assessment of a video card's operability, e.g. for 3D-modeling suites than for games. It is well seen that the increase in the number of pipelines for X800 series results in higher performance and some advantage of X1600PRO of the major rival - GeForce 6600GT. This suite models operation in various CAD/CAM-systems using scenes and modules of real suites. 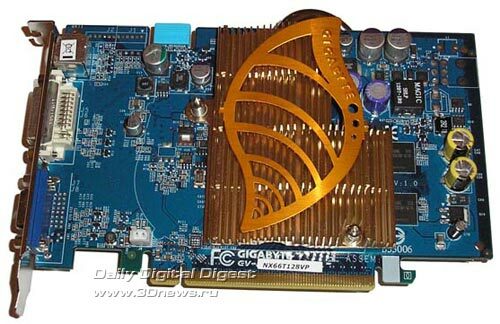 In the total, the winner is GeForce 6600GT of 256 MB onboard video memory. But the remaining results imply a different conclusion - performance in running applications is poorly dependent on the power of the video card. 3Dmark'03 shows an alignment of forces in games of the past years. The suite does not use over 128 MB memory, so the major factors which affect the result are the clock speed of the GPU, the number of operating pipelines, and the memory frequency. The failure of X1600PRO with 256 MB DDR2 is evident. 3DMark'05 allows estimating performance in modern games. That's where the new architecture X1600PRO allows to catch up and even somehow overtake GeForce 6600GT. On the other hand, the suite shows that 128 MB of fast memory is better than 256 MB of not very fast memory. Also of note are the superb results of overclocked X800GT - only overclocking saves the situation. It is also worth mentioning the practicality of 256 MB for GeForce 6600GT (increase in the cost of the card related to the rise of memory capacity is proportional to the performance boost). Futuremark 3DMark'06 is an absolutely new package which has integrated all the advancement of computer graphics of the recent years and shows an alignment of forces for future video cards. Since the future requires support for PS 3.0 and HDR, then the X800 series is no longer welcome there (the second part of gaming tests simply won't start on these cards). 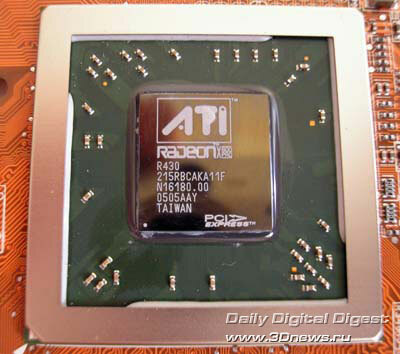 At that, we can congratulate ATI on the creation of a competitive chip which is able defeating GeForce 6600GT for smaller amount of money in future. Well.. synthetics is simply synthetics, but people play games. Far Cry is no longer fearful to video cards for quite a white, so they all provide comfortable gameplay for it, whereas for high-end video cards all depends on the CPU capability. In "Riddick", we found an annoying issue - the game simply wouldn't start with new drivers for GeForce 6600GT, but after a few unsuccessful tries to find suitable drivers we gave up the idea so as not to waste time. So, having set the texture AA and quality settings to the maximum, we selected the shader options SM 2.0 and compared to Radeon video cards. Unless most recent graphic features are used, then X1600PRO loses at performance, but it offers a lower price as a tradeoff, which is better even if compared to X800GT. 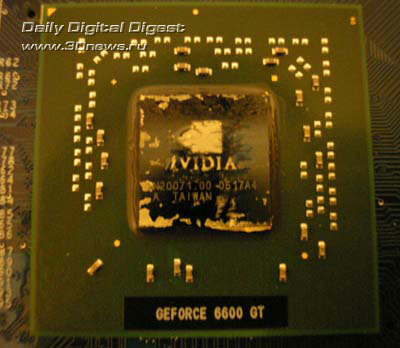 At Half-Life 2, with the image quality set to high, GeForce 6600GT demonstrated quite a good showing. The graphs depict performance reading for this and other games taken with the Auto-detect option selected, since many users prefer this way to get an optimum image quality at optimum performance. Serious Sam 2 at 1024x768 with the automatic quality adjustment provides a comfortable gameplay for any of the video cards, but once the best quality is selected, it seems the CPU is no longer enough. On the other hand, we were able to see the results for GeForce 6600GT with 256 MB memory - it surpassed even the overclocked X800GTO2. 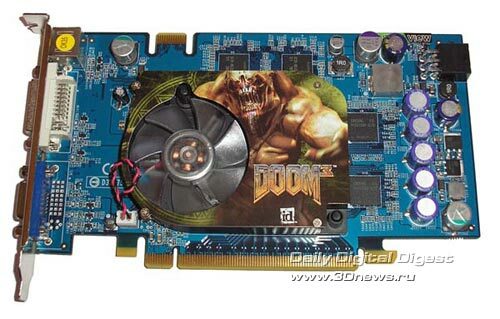 Doom 3 has always been a patrimony for NVIDIA cards, so we are not surprised by the results. As to X1600PRO, the conclusion is not very optimistic - the 4 texture units are unable fully loading 12 pixel pipelines. But Doom 3 is just a special case, and let's hope there will be fewer such cases onwards for X1600. Quake 4 is a sequel to the engine of Doom 3, so the results are unchanged and thus repeat. F.E.A.R. offers the hardest engine to date and in some ways expresses the demands of future games. At this game, X1600PRO has essentially rehabilitated, but the comfortable FPS at maximum FSAA and soft shades is attained only on X800GTO and X800GTO2. Well, what do we infer from our today's benchmarking? We can get answers to many questions. First, is the "middling" X1600PRO worth of attention? We can state with confidence: "Yes!". Despite the slightly misbalanced architecture, high operating speed of the GPU and memory allow producing a performance sufficient for the mid-end systems. For thrifty users, that is an ideal option for today's price level. In choosing a video card like that, we should be aware that 128 MB of fast memory is better than 256 MB of the slower. Secondly, are there are worthy warriors in the X800GT line? As regards the youngest X800GT, it can appeal to the buyer only for its price - unless it is cheaper than that for X1600PRO (very unlikely), you will have to master a new overclocking technique. 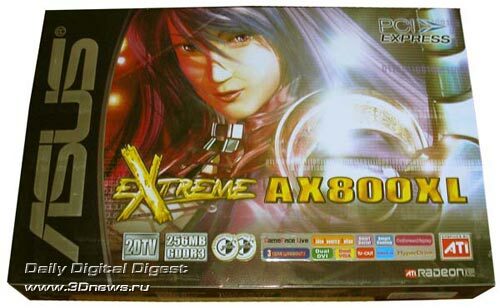 On the other hand, X800GTO can be quite a good buy unless it is more expensive than GeForce 6600GT. Despite some architectural lag, video cards on this GPU still offer some performance margin. Thirdly, what do the extra 128 MB video memory give? We can answer this question only based on examples of similar operating memory frequency. For such cases, we can state with confidence: "Yes, it gives much in new games." But, are you still playing old games?". Otherwise, the best video card will be the one whose memory runs faster. Генерация страницы: 0.176 с. Всего 8 запросов к базе.